The World Famous Kilgore College Rangerettes perform alongside 1,000 student musicians on the pier of the USS Battleship Missouri Memorial Wednesday as part of the 75th Anniversary Mass Band Performance at Pearl Harbor. 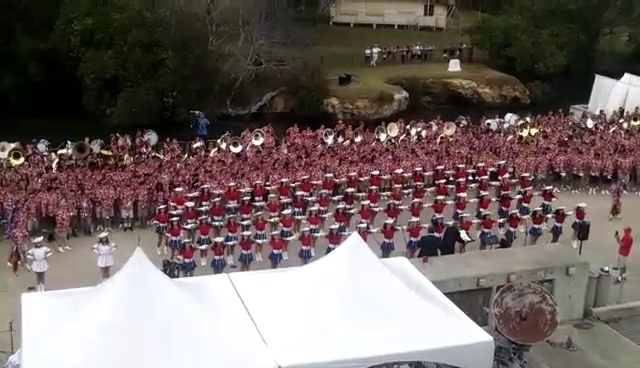 The World Famous Kilgore College Rangerettes performed yesterday along with 1,000 student musicians on the pier of the USS Battleship Missouri Memorial as part of the 75th Anniversary Mass Band Performance. The performance was part of the events coordinated on Dec. 7 to commemorate the 75th anniversary of the Dec. 7, 1941, attacks on Pearl Harbor. Organizers estimated about 4,000 people attended the events throughout the day, including 300 World War II veterans.